When it comes to planning out content for your blog and all of social media, I'm sure one word pops into your mind: overwhelmed. If the thought of coming up with blog content, maintaining an editorial calendar, finding or creating content for Facebook, Instagram, Twitter, and so on makes you want to curl into a ball on the floor, you're not alone! And I have the solution for you. 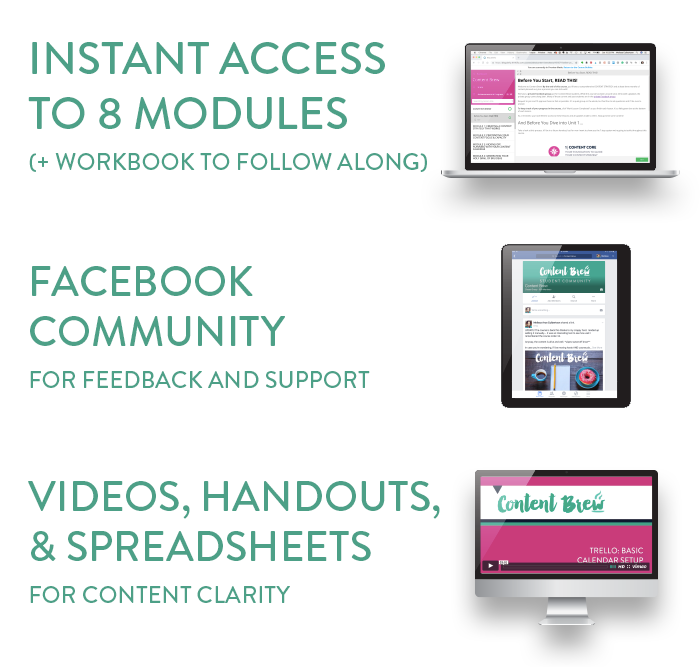 With my 18 years of marketing communication (aka content) experience, plus almost a decade as a blogger, I've perfected a system to help you create a steady stream of content on multiple platforms... that speaks right to your audience. What do you get in Content Brew? 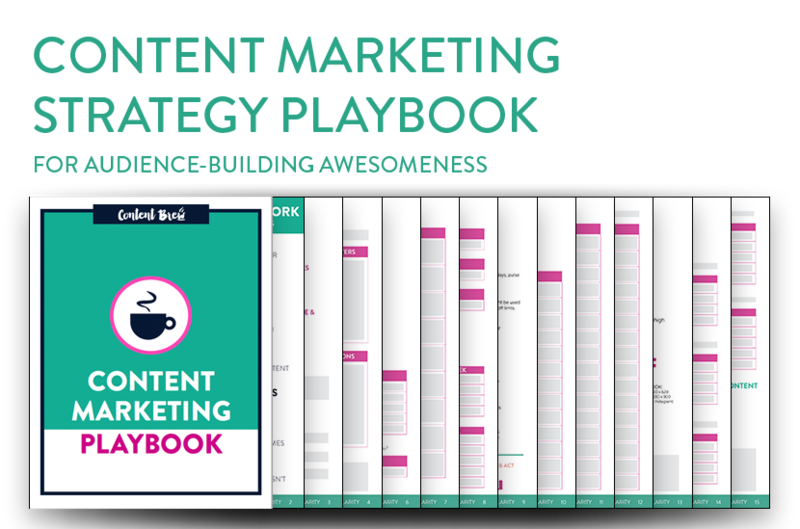 In addition, you get this 15-page Content Marketing Strategy Playbook. Use this fillable PDF throughout the course to build your unique content marketing strategy and all the guidelines that come along with it. It'll become your go-to guide to keep you on track with creating content that resonates with your audience and gets results. What exactly will you learn in Content Brew? You can’t create good content without a good foundation. Learn how to clearly define your blog’s purpose and build a target persona that details out exactly the audience you’re trying to reach. Build your “content core” so you won’t have to second guess if the content you create will click with your audience. No, you can’t write about every single topic and use ALL THE SOCIAL MEDIA. But how do you narrow down your focus and stay true to your passions? This module shows you exactly how. Learn to narrow down your content focus and use an eye-opening method to determine your content capacity. Not all editorial calendars are created equal. Learn EXACTLY how to build a robust, yet not-too-overwhelming calendar using one of three content calendar templates: a spreadsheet, Trello, or CoSchedule. Throughout the course you’ll get videos and tips to maximize the efficiency of each calendar. In this module, you kick off content planning with “small wins.” I’ll show you what they are and how to get them. Unleash a flood of creative ideas using mind mapping (with a twist). Find out what to look for in Google Analytics and elsewhere in order to brainstorm your best content ideas for your blog and social media platforms. This isn’t just about plopping ideas down into your editorial calendar. See how simple it is to not only come up with blog post and social media content ideas, but get more ideas from content already sitting in your lap. You’ll also learn a snazzy, yet simple way to run an idea bank for endless idea safe-keeping. No you can’t just share your own content on some social channels. BUT you don’t need to share as much as you think (I explain why). Learn to QUICKLY find content to share and how to automate the process so you have more time to make content and grow your audience. Bloggers and biz owners rarely take the time to create workflows that speed up their content creation time. In this module, you will! We also tackle the type of social media automation all bloggers should use— even from places you didn’t think possible. Learn how to create engaging social content and click-worthy promotional content. Plus, content is only good if it works. I’ll show you how to match your goals up with your analytics to determine what’s working for your audience. Plus, get a custom dashboard for Google Analytics to show you the most important content stats in ONE CLICK. You’re ready to have a full arsenal of content at your fingertips so you stop wasting time with the dreaded “I don’t know what to write about.” (or what to post on social). I tell you, there’s nothing better than sitting down to write a blog post and already knowing what to write about because it's on your calendar. Or getting ready for some social media interaction and already having a question ready to post. It’s like your brain already did most of the work ahead of time. Even if you have tons of ideas already but no time to write them, some of the techniques and handouts will help you save time so you can squeeze in some more writing into your life. The best part about this course is that it's not just reading, video-watching and downloading pretty handouts. You'll be DOING stuff. Planning content, learning techniques and getting loads of handouts that you'll reference long after the course is over. Yep! We don't limit the enrollment to just certain times of the year. You can purchase anytime you'd like and start learning the traffic-driving strategies right away. Once you sign up, you'll receive INSTANT access to all the units of the course. Go through them as slow or fast as you'd like. You can mark lessons complete too so it's easy to keep track at where you are in the course content.What Are the Course Pre-Requisites? And I'm sure you already have this, but you'll use colored markers and paper (yes, you'll go old-school for one assignment). Do I have to pay for any tools for this course? Not if you don't want to! I show you three options for building a content calendar and two of them are free. Aside from CoSchedule as a calendar option, all the other apps featured in this course have free versions (which I use)! Social media changes so quickly. Does the course get updated? Yep, it's updated regularly! Students get lifetime access to any updates as well. With a day job in content marketing at Burt's Bees and 18 years of marketing communications experience, I'm always keeping up with digital marketing trends and news. Absolutely! 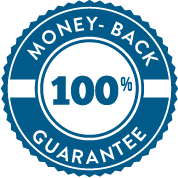 If you take the entire course, implement the strategies, and still don't get results, you can contact me within 60 days of purchase and I'll give you a full refund. Proof of work needs to be shown. I made a silly seal for ya, but the sentiment is real. Over a thousand students have learned how to build a content marketing strategy and editorial calendar. But if you take the entire course, learn the system, and still don’t get results, you can contact me within 60 days of purchase and I’ll give you a full refund. That’s how I roll. It's time to crush it with content your audience wants (in less time than you're spending now). If you're ready to implement a can-do system that'll leave you with endless content ideas AND more time in your day, then enroll in Content Brew now. You'll get instant access to you start planning and time-saving today.